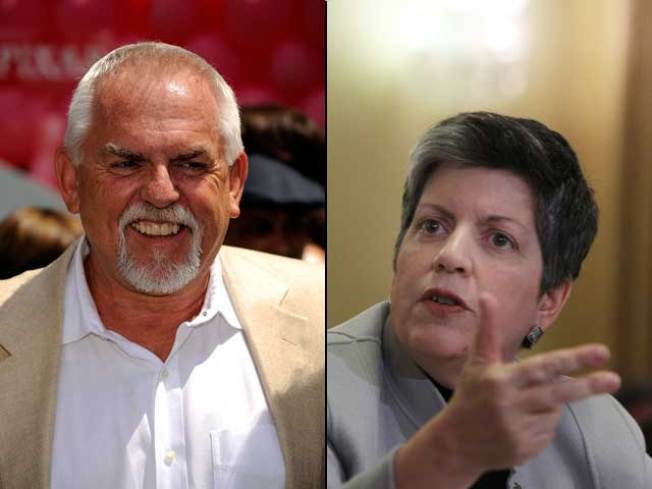 What happened when known Republican John Ratzenberger of "Cheers" fame ran into Homeland Security Secretary Janet Napolitano in the lobby of NBC News' Washington Bureau yesterday? Two conversations got crossed -- and it might have left Madame Secretary a little mystified. An NBC employee was standing nearby as "Cliff Clavin" was coming into the building for an appearance on NBC4's Daily Connection show. At the same time, Napolitano and her Secret Service posse were exiting. Noting the secretary was walking with a cane, Ratzenberger asked if she had a skiing accident. "Not exactly," Napolitano said as she hobbled past the former sitcom star. You may know him as Cliff Clavin, but your kids may know his voice from Toy Story. Meanwhile, one of the Secret Service agents saw a guy he knew in the hallway and noted quite loudly that he's a little balder than he used to be. Ratzenberger heard this and joked, "And you're getting fat, too!"